Since automatic promotion was introduced 31 years ago no club has won back-to-back promotions into the Football League. Even meteors such as Fleetwood and AFC Wimbledon required a season acclimatising to the fifth tier before climbing out of non-League. This season Salford aim to break the mould. Since being taken over by the five former Manchester United players from the ‘Class of 92’, as their youth team generation has become known, Salford City have raced from the eighth to fifth tier. As the busy Christmas programme approaches in the Vanarama National League they sit a point and a place off the summit and the promotion spot it brings. This after a slow start in which they took eight points from their opening six matches leaving them in the bottom half of the table. Salford have formed an academy, a women’s team and are developing community and education programmes. Moor Lane has been transformed into a covered 5,000-capacity venue. 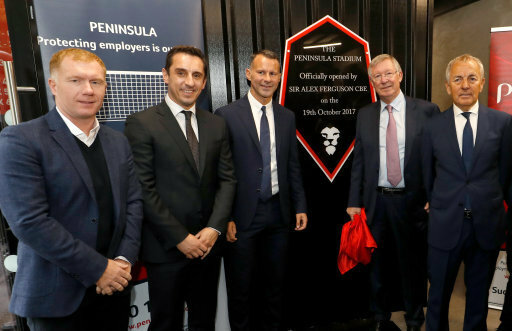 Crowds have gone from 220 to 2,000+ with an emphasis on making it an affordable fun day out - Neville said his family recently chose a match at the Peninsula Stadium rather than Old Trafford. For we fans the football experience at Salford is friendly, exciting, and affordable. And the owners are open and approachable… and are frequently to be found cheering (and – occasionally – groaning!) on the terraces, along with the rest of us. It’s a truly fantastic club to be a part of. It’s all well and good investing in the ground and I applaud the lads for that, giving something back is a noble gesture. I actually used to play on this ground as a kid as it was my local school football field so I know the transformation it has undergone. Unfortunately the surrounding area simply does not have the infrastructure to cope with the influx of people and cars that swamp the local streets every other weekend. My mum lives in Kersal Road and has running battles with fans every home game. Not great when you’re 82. Spend some cash on a proper car park please, to help the local residents. They pay a player £4000:00 pw, perhaps the money could have been better spent providing sufficient facilities for away fans. The facilities being provided by millionaire ex footballers and their millionaire Singaporean businessman are, frankly an absolute disgrace. Buying success on the pitch, whish is what they are doing is all very well as long as it’s matched by investment in the infrastructure.